Oil product stocks in the Middle East's key oil hub of Fujairah rose 6.5% in the week to Monday as heavy distillate inventories jumped to their highest level this year. 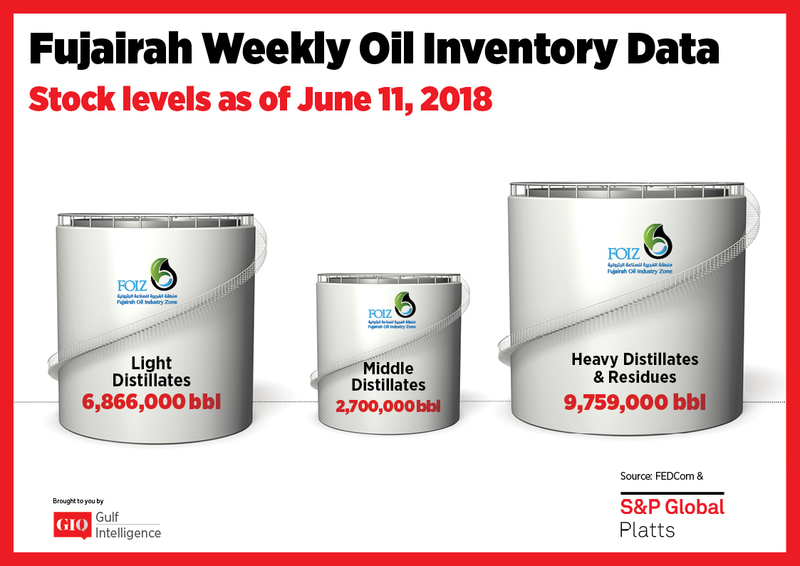 Total oil product stocks were 19.325 million barrels, up 1.18 million barrels from a week earlier, according to data from the Fujairah Energy Data Committee. Stocks of heavy distillates and residues jumped 21.7% on the week to 9.759 million barrels, the highest since December 25, 2017. That was also the last time heavy stocks exceeded 10 million barrels. Bunker demand in Fujairah was seen as average Tuesday. "The market is kind of quiet so far," a Fujairah-based bunker fuel trader said. "Overall demand was not too bad." 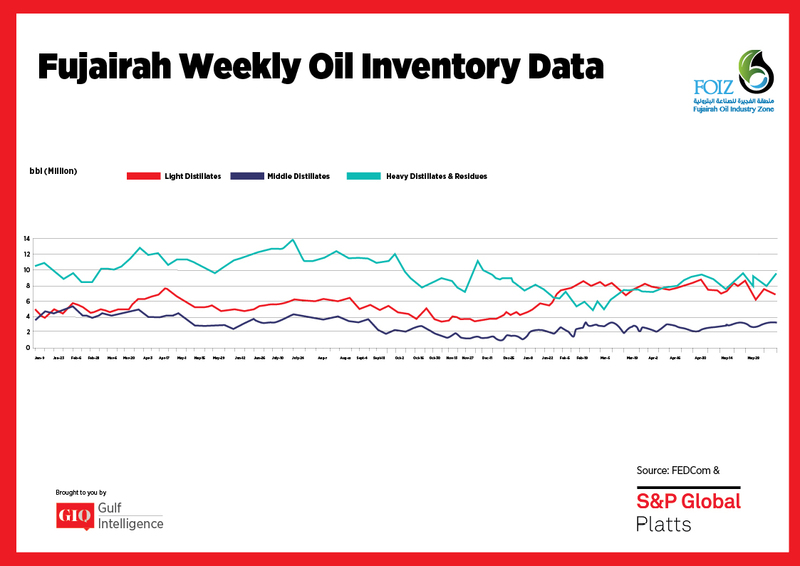 The first/second month time spread for Arab Gulf 180 CST HSFO swaps had a weakening backwardation to $3.85/mt Tuesday, possibly indicating some easing of the recent tightness in the Singapore market, S&P Global Platts Analytics said in a report Wednesday. Stocks of middle distillates also rose 2% on the week to 2.7 million barrels. Sentiment continues to be downbeat in the East of Suez market for middle distillates due to rising excess supply for both gasoil and jet fuel. Despite regular cross-regional flows to the West of Suez, rising freight rates and a strong Exchange of Futures for Swaps are making arbitrage economics increasingly difficult, the report said. Meanwhile, stocks of light distillates fell 8.3% on the week to 6.866 million barrels. Demand in both Asia and the Middle East has steadied since the beginning of Ramadan, while supply from regional exporters, in particular, China, is rising. 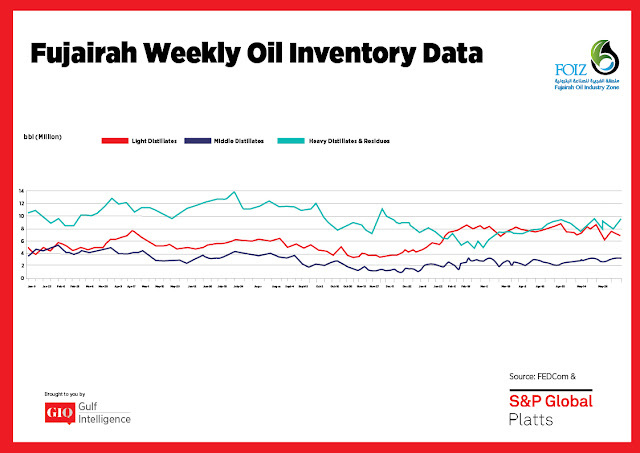 Gasoline tenders from Middle Eastern countries have been mostly absent since the start of June, but activity is expected to pick up with the end of Ramadan, Platts Analytics said. The Islamic holy month comes to an end Thursday or Friday.